The Opera Project presents an musical extravaganza featuring stirring arias, traditional costume and an international guest star! 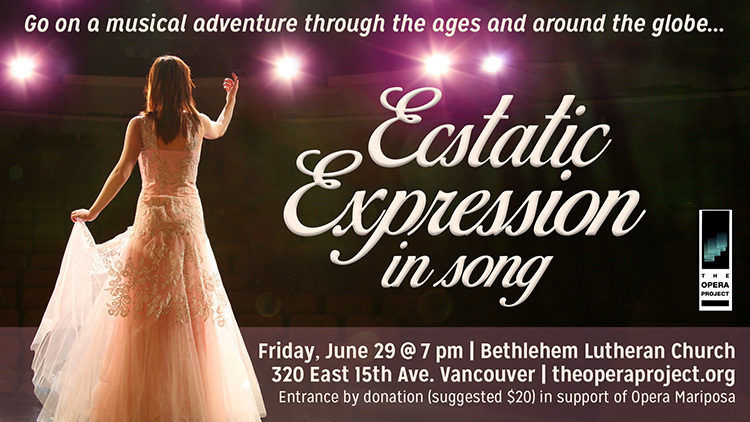 Acclaimed Canadian soprano Heidi Klassen leads an all-star cast on a musical adventure from the early music of Bach, Handel and Mozart to romantic highlights by Verdi and Puccini. Enjoy familiar favourites like Gershwin alongside sensual Spanish guitar, Chinese and Turkish music. Don't miss a guest appearance by Arzu Semerci from Istanbul Opera, performing with the Vancouver Turkish Choir Orchestra. Proceeds support Opera Mariposa, a Vancouver organization for young and emerging performers.